Saturday September 21st 1895 I hurried through with my morning work and took down the butter and chickens. I got a few things and was home in time to get the boys dinner. I washed windows in the afternoon and finished my letter to Mrs. Luck. Sunday September 22nd 1895 It was too awful warm to go to church. We went over home for dinner found Mr & Mrs Denton and Mrs Bradly there. We hurried home about three oclock to escape a rain. It turned very much cooler. Did the evening work and read in the evening. Monday September 23rd 1895 I picked a lot tomatoes over this morning. Some were to send to Mrs Moore and I put up some myself. The boys were working about the barns all morning. Oliver helped me wash in the afternoon and Will went to town. Tuesday September 24th 1895 I had such a large ironing that it took most of the day to do it and then I had baking and scrubbing to do. I was very tired at night but wrote a letter to Ida and a few lines to Miss Lewis & Bird Harris. The boys finished hauling the corn away today. 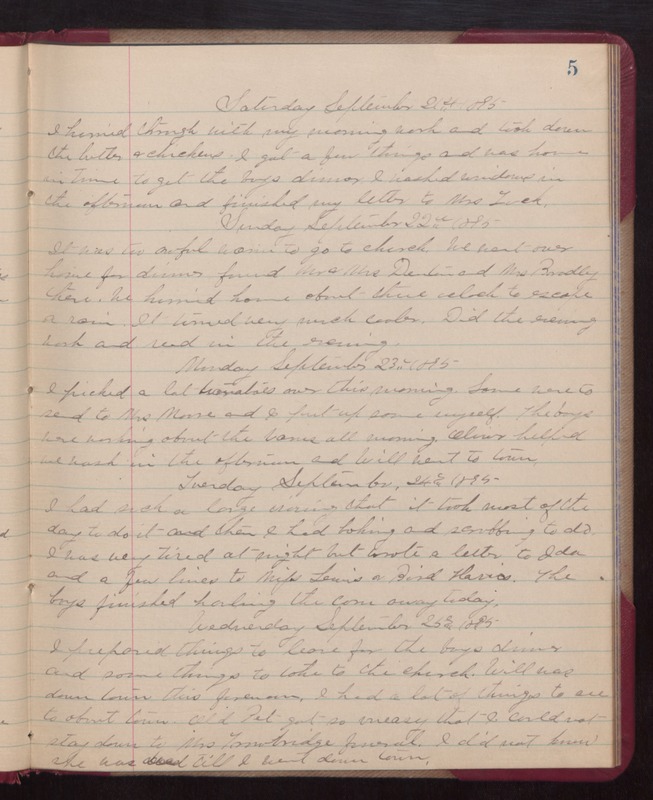 Wednesday September 25th 1895 I prepared things to leave for the boys dinner and some things to take to the church. Will was down town this forenoon. I had a lot of things to see to about town. Old Pet got so uneasy that I could not stay down to Mrs Trowbridge funeral. I did not know that she was dead till I went down town.